Fed Chairman Ben Bernanke responded to the question of why central banks hold gold by simply stating, “tradition”. Gold does not produce earnings or dividends, many banks and investors do hold it for among other reasons traditions. However, a single ounce of gold the size of a pad/pat of butter, can sell for over $1,200 today. What it makes it so valuable? Almost anything can be used as money, though some things typically sell better than others. It is hard to transact an exchange of value with items that people do not want and that stores do not value. Over thousands of years, gold has become the best form of money. For centuries Mankind has chosen gold over other assets because it can not be destroyed by water, time, and fire. Gold does not need feeding or fertilizer like animals and plants. Gold is uniquely malleable, ductile, beautiful and rare. Gold has the ideal chemical properties to serve as money and a good store of value. Gold is arguably the most attractive of the 118 elements in the periodic table. Gold has been a successful form of money because it captivates. Gold is the only asset that is not simultaneously someone else’s liability. Gold does not require backing of any bank. Gold will not suffer a default or its value to fall to zero. When there is no counter-party risk that means that once you have the gold in your possession, you do not have to depend on someone else to fulfill a contract or keep a promise of its value. Gold has very specific characteristics that make it highly valuable. Gold has no time limit, counter-party risk, or shelf life. Gold is liquid, portable, durable, consistent, convenient, and value dense. Gold can not be printed, hard to counterfeit (but sometimes happens), or inflated. Do you have gold you are interested in selling? The Chicago Gold Gallery is where you should go to sell your unwanted gold, jewelry & coins for cash. 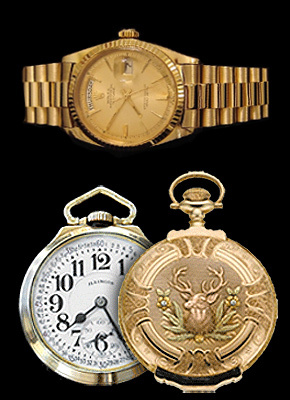 We take pride in offering the best possible price for your jewelry, old gold, diamonds, watches and collectibles. It does not matter what type karat gold you have,our expert buyers in Chicago will carefully assess, inspect and evaluate all of your items individually to insure you are getting the best prices for your gold!